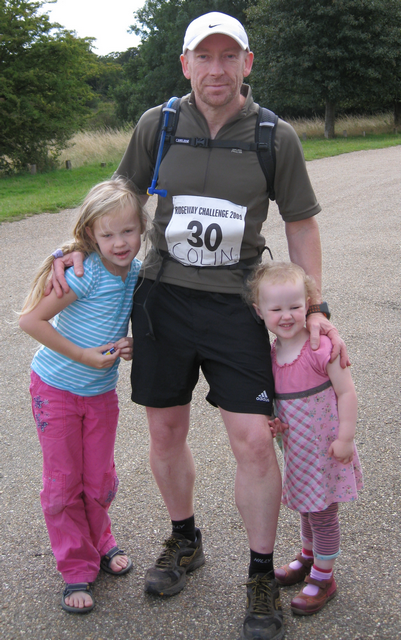 Race Report “The Ridgeway 85 mile Ultra” 29th & 30th August 2009 « Shuffling Along . . . . .
We pulled onto the road leading to Hemel Hempstead, Hertfordshire where we would spend the night at a hotel before the run. The weather was appalling, we could see lightening flashing in the night sky and the rain bounced off the car bonnet. Myself and Samantha my wife & our three children booked into the hotel & I set about getting my kit ready for what looked like a very wet race the following morning. When the alarm went off & we looked out the window we couldn’t believe the weather, it was sunny! We always stay at Premier Inn so I can be sure of getting the right food. I went for my usual ultra breakfast, two rashers of bacon,eggs,mushrooms,two sausages,three large muffins,two large bowls of muesli,two croissants,two pots of yoghurt,toast with honey,marmalade & jam washed down with three large cups of cappuccino and some orange juice. Then we loaded the car up and off we went to register. We arrived in plenty of time to register & met my JOGLE training partner Neil Bryant on the car park where we would receive our numbers and race details. The car park was full of ultra runners preparing for the start & most looked very nervous about what was to come over the next 24 hours. Neil was telling me he needed to take 4 weeks off training soon, to have some metal plates and screws removed from his leg & the screw holes needed to mend! We pinned our numbers on & set off for the start at the summit of Ivinghoe Beacon. When we arrived there it was sunny but with a slight breeze, perfect. A lot of the runners looked like they were about to do the Marathon De Sables with all the Raidlight bottles and rucksacks, Lycra clothes and some even had sand gaiters on. We set off and most were off like they were running a 10K! The cut-off times were very short due to the race being part of the ultra running championships & we were all aware of the times we needed to be at the checkpoints. All together about 100 runners took part. Myself & Neil had decided we would go nice and easy and spend a maximum of 2-3 minutes at each checkpoint (9 in all). We were both surprised at how hilly the course was and how many tree roots we kept tripping over. Most of the course was up & down The Ridgeway which is a large ridge of what looks like chalk & a mix of flint stone and soil tracks winding their way through forests and grain fields. The trail is said to be over 5,000 years old and passes by fantastic scenery & a few ancient monuments. Before we realised it we’d covered the first 31 miles and were approaching checkpoint 4, this was the point I’d decided to put on my head-torch for the night running. I filled my Camelback with water and started eating as much food as I could get down within our 2-3 minutes, I had a few pieces of cake, a hand-full of Jaffa Cakes, some flapjacks & came away from the checkpoint with a hand-full of caramel biscuits & some fruit cake to eat while we ran. The marshals at the checkpoint informed us we were in 70th place so having started near the back we had already made 30 places. Soon it was dark and we ran beside a canal where people sat on barges drinking glasses of wine & we could hear the glasses chinking as we made our way through the deep grass and onto the next section. We’d talked and laughed our way to 43 miles and checkpoint 5 where we had a hot meal waiting. Our strategy was to get going again as soon as we could so we were surprised to open the church hall doors to see what looked like a scene from a world war two film with people everywhere in various states of exhaustion. Most were sat at a huge table with food everywhere and most of the runners had pained expressions on there faces. Some were repairing blistered feet others looked like their race was over. In all I would guess 30-40 runners were in the hall so we gulped down a red hot jacket potato with cheese & beans & some more biscuits and bananas & made a dash for the next section. Just before checkpoint 7 at 61 miles the course started to get very dusty & rutted and I remembered all the runners with gaiters on at the start and realised why. Tiny stones had started to make there way into my trainers and big pieces of flint where everywhere which made it very uncomfortable on the soles of your feet. Ahead in the distance we could see what looked like lights and hear faint music. As we approached four people came screaming out of the darkness, a woman with a glass of wine followed by 3 men with cans of cider! We thought they were about to attack us but they just ran past and into the night. As we got closer to the music we realised we would be running by an illegal rave. It was a very surreal experience seeing the fires and lights having run 60+ miles it was almost as if it was a dream. Approaching 65 miles I suddenly lost my appetite and started to feel very cold, up to this point I just wore my t-shirt and shorts but the cold of the night and the miles plus the loss of appetite was starting to take it’s toll. 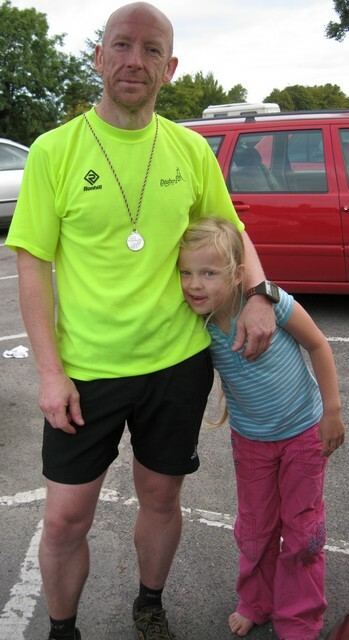 I knew from other long runs how important it was to keep eating & knew this was a bad patch coming on. When we reached checkpoint 8 at 69 miles I was loosing the feeling from my feet & hands and the stomach spasms were starting. Realising it would take me longer than 2-3 minutes to get away from this checkpoint I shook Neil’s hand and wished him well, he knew I was having trouble and its a kind of unspoken rule that if one of us gets sick the other carries on. I stumbled over to the car where my family were and Sam asked how I was but I just felt sick and had a bad stomach & felt like I had to get rid of what was causing it so off I went into a field to do the necessary. I was so ill I forgot to take my head-torch off so everyone at the checkpoint could see me! That was the least of my worries, by the time I got back to the car the spasms from my stomach had spread to my arms and when Sam passed me a cup of coffee I couldn’t keep it in the cup, my arms felt like someone else’s. I sat on the back of the car & Sam put a coat on me and told me nobody had passed as I tried to get my head back together. Just as she said that 3 runners came out of the night and started to eat at the checkpoint, I knew they had seen me & would soon be taking my place so I stood up as they ran past and started after them. It took me about 30 minutes to catch them but they were not for letting me past. We played cat & mouse for the next few miles and eventually I got my place back, they seemed to give up as I passed and started walking. I wished them well and went on my way, happy that the bad patch was behind me. 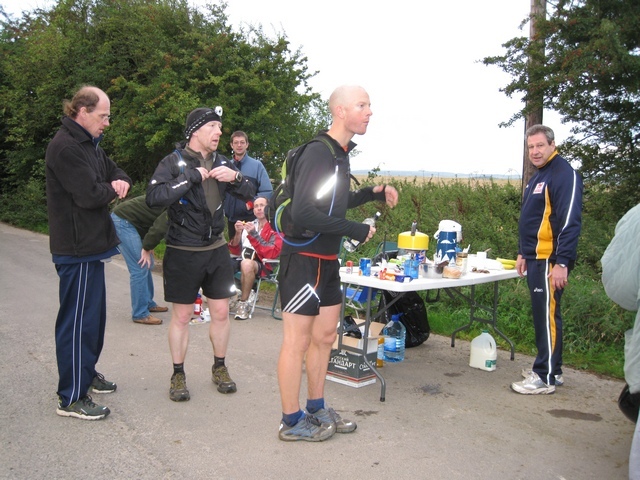 I got to checkpoint 9 at 79 miles in the light of morning and my mate Neil was just filling his face as I ran in, we nodded to each other and he still looked strong but had probably had a bad patch too as I’d caught him up. I decided I needed some serious calories as I’d just emptied my stomach so I had a huge piece of salami which went down a treat. Neil set off as I was eating and after a couple of minutes I set off after him. The next section was a bit tricky as the sign telling you which way The Ridgeway went pointed in-between three possible paths, I’d jettisoned all my unwanted weight at checkpoint 9 to try to get to the finish as fast as possible and one of the things I’d left was my hand held SatMap GPS which would have told me which path to take. I had to resort to a more tried & tested method, eeny, meeny, miny, moe! The path I chose at first looked right until I reached a wooded area which looked nothing like the rest of The Ridgeway, it was the wrong track. I retraced my steps and tried another route. This looked more like it, I could see runners ahead walking & running the rolling hills which went on for a good few miles so you could see maybe ten or more places in front of you. last checkpoint after 79 miles only 6 miles to go! why have I still got my headtorch on? finish line and the finish crew though I’d fainted! They laughed when they saw me spring back to my feet, it was a great race & one I’ll never forget. I went inside and ordered a bacon butty & a brew. Neil looked like he’d been back about 10 minutes & as we sat and chatted about the last section the organiser came over and shook my hand and said well done your second vet 45 & 16th overall! I couldn’t believe it, when we planned the race I hoped to get under 24 hours. I looked at my Forerunner & it said 20 hours 23 minutes. I was over the moon, this was one of the best organised races I’ve ever done & well worth doing again next year! That’s some ultra breakfast you have there Colin !!! Sounds like a good race .. hope training is going well. Can you tell I’m sponsored by Premier Inn! It’s going well upto now, how are you doing?? Shin is still giving me few problems … grrr … but getting there. Nice site by the way … mine needs a revamp and currently working out adding a comments bit too !! Know what you mean about the shin problem, still got that lump on mine but it does seem to be going down. If you need any help or for me to host it just let me know, I’ll set it all up & you’ll have one like this at cost.